Greetings again from the darkness. Oscar nominated writer/director Oren Moverman (The Messenger, 2009) takes the source novel from Herman Koch and turns it into a checklist of items and people to detest. Rather than a cynical look at humanity, we endure a shrill commentary on white privilege, entitlement, misguided parenting, social media for millennials, and mental illness. If somehow the world and local news doesn’t feature quite enough ugliness for you, then Mr. Moverman’s movie should fill the gap – making Roman Polanski’s Carnage (2011) look like a light-hearted comedy by comparison. It’s definitely no Who’s Afraid of Virginia Woolf or even My Dinner with Andre. Dinner for four at an over-the-top ostentatious restaurant is the setting, and aggravation is the sauce for each course – labeled on screen for our convenience as Aperitif, Appetizer, Main course, Cheese, Dessert, and Digestif. Richard Gere is Congressman Stan Lohman, a candidate for Governor and a slick politician in the midst of a battle to get the necessary votes for approval on his sponsored bill. He is joined by his second (yes it matters) and much younger wife Katelynn, played by Rebecca Hall. Rounding out the foursome is Stan’s estranged (and strange) brother Paul (Steve Coogan) and Paul’s wife Claire (Laura Linney), who is every bit as off-center as her husband. These four have no real interest in sharing dinner time conversation, but the horrific actions of their teenage sons have brought them together for a strategy session. Michael (Charlie Plummer) is Paul and Claire’s son, while Rick (Seamus Davey-Fitzpatrick) is Stan’s son with first wife Chole Sevigny. Video of their despicable and unforgivable act has been posted on YouTube, and now the four “adults” are convening to decide the best step for these “good kids” who just need help getting back on track. At least that’s what Claire would have us believe. In fact, if satire exists at all in this script, it surely would be in the fact that the politician is the only one to exhibit any semblance of moral fortitude in this situation. We even hear the incident described as “an unfortunate chain of events” … further emphasizing the film’s theme that EVERYTHING is political these days. The film itself is often too-congested and convoluted. The flashbacks are messy and unnecessary, and the dialogue ill-timed and seemingly written for shock value rather than with situational purpose. No one does droll like Steve Coogan, yet his character spends the film sermonizing (with his running narration of a Gettysburg analogy) and showing no signs of humanity. The big reveal with his character is borderline shameless and insulting. Somehow we are left to ponder who shows the worst judgment – the teenagers or the adults. Evidently we are supposed to feel the moral outrage that all of society is now driven by politics, and in politics, “someone always gets hurt”. Personally, if I have outrage, it is directed at a manipulative film that stole valuable time from me. Greetings again from the darkness. On July 15, 1974, television news reporter Christine Chubbuck read a prepared statement and then committed suicide on-air by putting a gun to her head and pulling the trigger. You may not recognize her name, but you have likely heard the story … it’s no urban legend. Director Antonio Campos and writer Craig Shilowich offer up a biopic with some insight into Ms. Chubbuck’s personal and professional life so that we might better understand what drove her to such a public and tragic end. 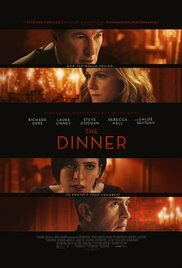 Rebecca Hall takes on the titular role (don’t mistake this for the 1983 John Carpenter/Stephen King film), and despite her usual stilted on screen mannerisms, she delivers what is an emotionally raw and nuanced performance that is the best of her career … and one that keeps us glued to a story of which we already know the ending. We see a woman dedicated to her vision of the profession, while being maddening to those who know her, love her, and work with her. She has an awkward intensity that compounds her lack of social skills and an ongoing struggle with depression. Somehow, Ms. Hall allows us to understand the personal and professional struggles and how things could have spiraled into hopelessness for Christine. The commentary on the early days of tabloid journalism (“If it bleeds, it leads”) is especially interesting given how the current Presidential campaigns have been covered more than 40 years after the film is set. 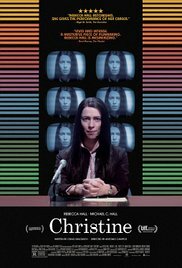 One might also note the parallels to the character of Howard Beale in Network (1976) … though Christine Chubbuck was less vociferous and never took to yelling “I’m mad as hell, and I’m not going to take it anymore” while on camera (though she evidently felt that way). Support work comes from Tracy Letts as the frustrated news director, Michael C Hall as the mixed-signals anchorman on whom Christine has a quiet crush, J. Smith-Cameron as her mother and housemate, Maria Dizzia as her friend and co-worker, and Timothy Simons as the misunderstood and ignored weatherman. The film clearly makes the point that Christine was a misfit in her work and personal life, and though some of the timeline and known specifics are either re-worked or ignored for artistic purposes, Ms. Hall must be commended for highlighting the effects of depression. Even the best meaning friends and family can unintentionally make things worse. We see a clip of Walter Cronkite’s actual report of her death, and Christine’s own words – “The latest in blood and guts” – were actually ahead of her time. Greetings again from the darkness. If I find myself three minutes into a movie and have already executed a couple of eye-rolls, any hopes for a decent little Romantic-Comedy-Drama would ordinarily be dashed. However, having Rebecca Hall’s character narrate her writing efforts as she taps away on the keyboard, actually does serve the story. The first feature from director Sean Mewshaw and his screenwriting wife Desiree Van Til takes advantage of a beautiful setting, a slew of contrasts, and some heartfelt music to keep us interested in how things plays out. Ms. Hall plays Hannah, the grieving young widow who has stashed herself away in a lakefront cabin located in the rural Maine community in which she was raised. Her grief remains burdensome some two years after the tragic death of her husband Hunter Miles – a folk singer whose only album (and subsequent death) created a public mystique and a defensiveness on the part of Hannah to protect and control his legacy. As a Ph.D from Brown, periodic contributor to the local newspaper, and soul mate of Hunter, Hannah undertakes the writing of his biography in the shadow of the studio monument that continues to expand with trinkets left at his gravesite by a cult of fans paying respect. Griffin Dunne plays her friend and owner of the local bookstore and publisher of the newspaper. His less than enthusiastic critique of her early pages of the biography correspond with the vigorous pursuit by a Hofstra Pop Culture Professor with a book publishing deal who wants to make Hunter a key element of his new project. Jason Sudeikis plays Andrew, and his fast-talking big city mannerisms don’t initially mesh so well with the hyper-sensitive and protective grieving widow. The two spar like brother and sister, and the initial adversarial relationship means only one thing in the movie world … romance is in the air. Fortunately, the focus on telling the story of Hunter acts as a form of grief therapy for Hannah and a bit of redemption of spirit for Andrew. Of course, the path to enlightenment is not simple for either. Hannah’s “friend with benefits” is a hunky local power company worker played by Joe Manganiello (“True Blood”), and Andrew’s big city music industry girlfriend is played by Dianna Agron (“Glee”). But as you would expect, the biggest obstacle faced by the two leads is their own stubbornness. We learn the most about Andrew and Hannah when they are around others. An Easter luncheon with Hannah’s family is especially insightful. Her parents are played by Blythe Danner and Richard Masur, and as viewers we long for more scenes featuring these two characters (and terrific actors). We sense that these parents see right through Andrew and Hannah. Can Hannah let down her guard so that she can move on with life? Can Andrew quell his ambition so that the emotional connection takes place? 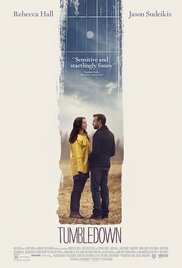 Beautifully shot (with British Columbia substituting for Maine), the aspect of nature plays a role in contrasting country girl with city boy, and it’s the accidental discovery of a long lost song that highlights the stark difference in motives … while also being the impetus for change. Hunter’s original music is heard throughout the film, and it’s actually Damien Jurado whose singing and songwriting add an element of intrigue and realism. Hannah, as narrator, states “In the middle, we feel like it’s never going to end.” While that may be true for many romance movies, the filmmakers here avoid the “too cute” moments that spoil most in this genre … and impressively overcome those early eye-rolls. Greetings again from the darkness. Joel Edgerton has become one of the more interesting actors working today. His projects range from indies like Warrior and Animal Kingdom to award winners like Zero Dark Thirty and big budget releases like The Great Gatsby. He has written screenplays, and now comes his feature length directorial debut … and an impressive debut it is. 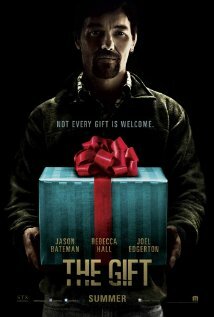 Simon (Jason Bateman) and Robyn (Rebecca Hall) are seeking a fresh start as they relocate to Los Angeles from Chicago. A new house and new job are an attempt to put an unfortunate situation regarding an unborn child behind them. Things get off to a great start for them as they buy a beautiful house, and Simon is put up for a promotion. An encounter with Gordo (played by Edgerton) leads to some awkward social interactions and some downright creepy stalking. The film will work best the less you know about it. The psychological thriller aspects never devolve into the slashfest we have come to expect. Instead the film blurs the lines between good guys and bad guys. In fact, it brings into debate what makes a good person … it even states “you may be through with the past, but the past isn’t through with you”. Do our past misdeeds ever totally fade? What about high school bullies … do they mature? Can the proverbial zebra change its stripes? All of these questions and themes are touched. While you may struggle to identify the protagonist and antagonist, the performances of both Edgerton and Bateman are fun to watch. And it’s Ms. Hall who is the grounding force who initially trusts both men, before questioning everything. There is also a very nice, understated performance from Allison Tolman as an understanding neighbor. Ms. Tolman was terrific in the first year of the “Fargo” series. Don’t allow anyone to tell you much about this before you see it … just know that it will remind you of the importance of the Golden Rule. Treat others how you would like to be treated … or know that bygones are never bygones. Greetings again from the darkness. I try to spend very little time re-hashing movies that deliver very little … I prefer to move on to the next one with a clear head. This one frustrated me because it could have – even should have – been so much more. Director John Crowley was responsible for the very entertaining Michael Caine film Is Anybody There? and writer Steven Knight penned three scripts that I very much enjoyed: Dirty Pretty Things, Eastern Promises, and Amazing Grace. The cast is very talented with Eric Bana, Jim Broadbent, Ciaran Hinds, and … well … also Rebecca Hall and Julia Stiles. So why does it feel so empty? The movie begins with a horrible act of terrorism – a suicide bomb in London that we view through a grid of 12 closed circuit screens. You would be incorrect if you think there is a payoff for frantically scanning all screens looking for clues. This device is nothing more than a reminder (over and over again) that we are constantly being monitored while in public. The ensuing trial provides a peek at the British legal system, but the most interesting sub-plot … the young son of the accused terrorist … is minimized in favor of the generic romance between two legal defense attorneys (Bana and Hall). Additionally, Ciaran Hinds’ character is simply too easy to read and Ann-Marie Duff is totally miscast. My favorite moments were the all-too-rare exquisite verbal diatribes from the great Jim Broadbent. Chalk this one up as a forgettable would-be/should-be political legal thriller that just doesn’t thrill. It’s of little comfort to know that I was probably being watched on the theatre security cameras as I longed for something worth watching on the screen. They may be watching, but you shouldn’t. Greetings again from the darkness. Seeing this film back-to-back with Mel Gibson‘s The Beaver was a mistake. Following up manic depression with severe alcoholism and mild depression is just a bit too much weight in such a short time. But I guess that’s the point of this one. Will Ferrell stars as Nick. He loses his job, punctures his boss’ tire, and finds out his wife not only left him, but also locked him out of the house with all his belongings in the front yard. That’s in the first 8 minutes of the film. Ferrell proceeds to get drunk … while sitting in his La-Z-Boy in the front yard. He clearly has hit bottom and shows no signs of recovering. At least not until he partners with a lonely, young, bike riding boy named Kenny (Christopher Jordan Wallace, son of Notorious B.I.G.). This partnership consists of Kenny doing most of the work for the yard sale while Ferrell sleeps and drinks. Rebecca Hall plays a pregnant woman who is moving in across the street. “What kind of man makes his wife move across country alone?“. That’s the question Ferrell asks Hall … and along with the viewer, these two characters understand the answer would be a man just like Ferrell. What I like about the film is that there are numerous signs of real human emotion throughout, yet none of the main characters overplay their part. If you are unaccustomed to seeing Mr. Ferrell in anything but slapstick comedies, I encourage you to see Stranger Than Fiction. He really does have dramatic acting skills on top of his amazing comedic talent.